The Skeleton Twins wasn’t the best film I’ve seen this year, but it may be tied for the most influencing (Boyhood being the other). I jokingly said that I was about to watch the Adam and Ashley Story, joking that the two leads mirror the lives that my sister and I are currently in the middle of navigating. Take away a few plot points and get right down to the thematic basis for the characters and that’s what I mean. Bill Hader and Kristen Wiig were two paramount actors on Saturday Night Live and we’ve seen their acting chops since they both left the famous sketch comedy show, but not like this. Hader and Wiig play Milo and Maggie. They haven’t seen each other in a decade, but have to navigate their lives back together after Milo attempts suicide. Why isn’t important; it’s implied, but what I like about the opening sequences is that director and writer Craig Johnson (script was co-written with Mark Heyman) focus on the emotions of Milo, not the motives. Hader’s character is complicated. He’s gay; he’s depressed; he’s in love; he’s heartbroken; he’s protective; he’s angry. The character slowly unfolds over the short 90 minute film. Even though the film is about the twins, I gravitated towards Milo’s story over Maggie’s. There are subtleties to him that are never explicitly revealed, but the audience knows. Maybe we all didn’t put in the same backstory, but we all gave him a story that connected with us. Sometimes, the best thing a director can do is give less and not more. That’s what Johnson did so well. Even with Wiig’s role. She’s complex, even if her story is a little cliche. It’s a cliche that so many people have actually fallen into. The film could have shied away from her complex marriage and relationship with her mother, but didn’t. It worked because it was real. Watching The Skeleton Twins should have made people laugh and cringe and question aspects of their lives. I know it did for me. The theme of depression is nothing new, and the film doesn’t take a new approach. Like I said, this isn’t the best film I have ever seen, but it is one that pierced me as I was watching it. It reminds me of a light version of Nebraska, one of my favorite “think” films. 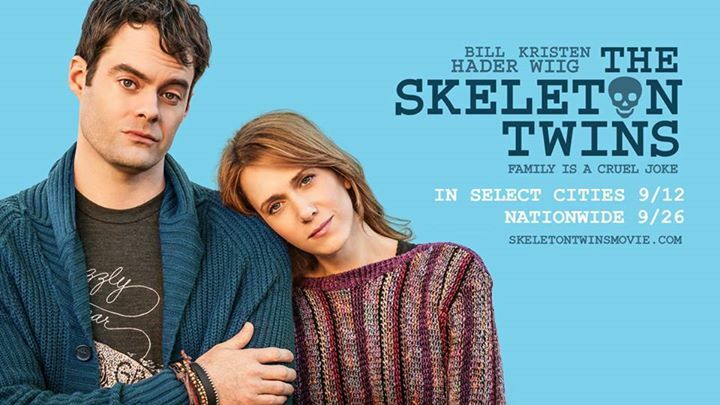 The Skeleton Twins is a good film and worth seeing. Hader and Wiig deserve all of the applause from critics. Hopefully they are recognized for their efforts in this film. Perhaps not winning awards, but being nominated and talked about.